Note: I skipped mentioning the dinner I had last night, because it was nothing special at all. But I’ve thought about it, and I feel that if I’m going to tell everyone about the good parts of this trip, I should also mention the spots to miss. W Burger Bar on College St was the culprit. Soggy burgers, soggier cold fries, an incorrect order and less than great beer was the offense. The first place in North America that I’ve not wanted to leave a tip. Just head to Fran’s right next door instead, you won’t be disappointed. Not much of a beery day today. It started in the MASSIVE Eatons Centre to pick up some threads for the wedding and another breakfast juice to heal my soul. From there it was on to the Design Exchange to see the ‘This is not a toy’ exhibit, which blurred the line between art and toys and was pretty awesome in general. It’s co-curated by Pharrell Williams, and is well worth a visit for anyone who loves toys but are too old to play with them. Lunch time found me looking for something quick and tasty, and it was ‘Bhan Mi Boys’ on Yonge St that took care of me. The Five Spice Pork Belly Bhan Mi was awesome, highly recommended if you find yourself in the area. By now it was 5pm, and I realised that I HADN’T HAD A BEER ALL DAY!! So I headed back to the hotel to tuck into one of the beers I had in the fridge. 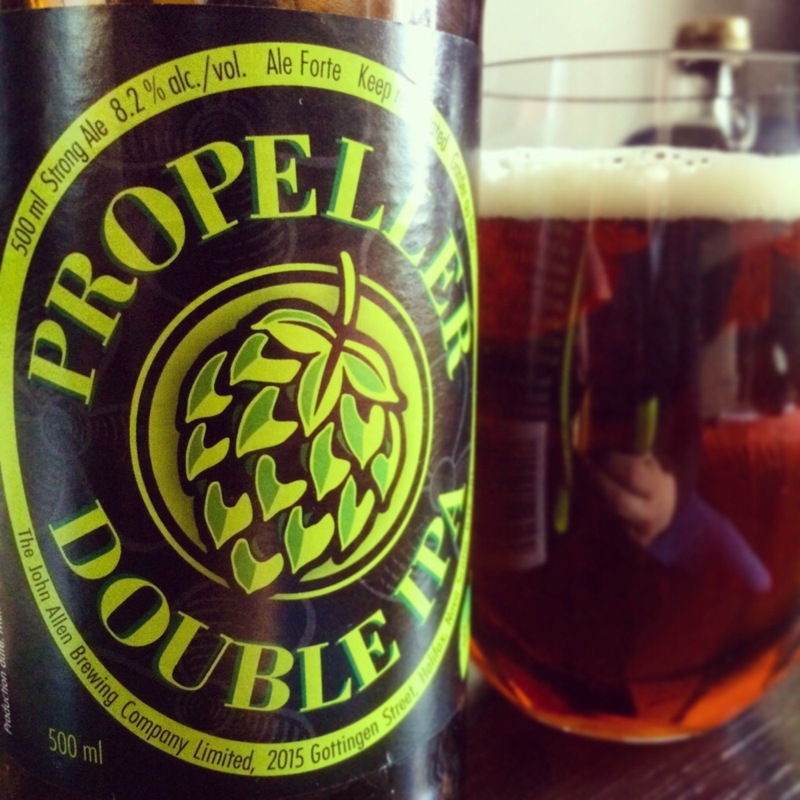 My choice was the Propeller Double IPA, and damn I was I hop heaven. Labelled as ‘a TRUE hop bomb, for TRUE hop heads’ it definitely lives up to that statement. Massively hoppy with a great malt sweetness to balance it out, this is a true West Coast classic, even if it’s brewed in Halifax (quick geography lesson, Halifax is VERY east, and in Canada). After that it was time to get out and about again, so I headed to Reds Tavern Downtown, which is a block from my hotel, to try and get another local brew in me. I succeeded too, ordering a Double Trouble Hops and Robbers IPA. Awesome name, and the beer was solid as well, although it’s difficult for any beer to perform when your palate is still recuperating after the Propeller DIPA. For dinner it was off to Daily Sushi for the biggest bowl of Ramen noodles I’ve ever had. It was ok taste wise, but I couldn’t recommend it unless you were nearby.